The Great Pyramids of Giza are known for having “the mummy’s curse” as well as being haunted by a man and his three children. Dressed in 1920s-style clothing, they appear to be looking for someone within the walls of the pyramid. There are two theories that surround the group: that the adult man is an archaeologist looking at the pyramid, or he is looking for his deceased wife. 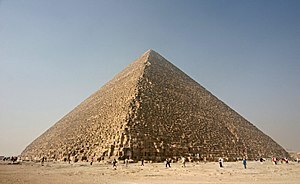 The ghost of King Khufu has been seen coming out of one of the more well known pyramids, the Great Pyramid of Giza. He appears dressed in ancient Egyptian armor, and he known to enter people’s houses and demand that they “get out now!”. Many ideas surround this odd phenomenon.